What's the name of this movie again? Before the inevitable numbing effect of media overload set in, the death of Michael Jackson struck a real emotional chord with children of the late 1970s and early 1980s. Anyone 10 years old when Thriller was released in 1982 is now 37 years old, members of a demographic typically at the zenith of their personal and professional adult lives. Like the deaths of Buddy Holly, Elvis Presley, and John Lennon before him, Jackson’s passing put an entire generation in touch with its own mortality. Even for those who never saw themselves as Jackson fans or had long ago resigned him to the dustbin of pop music history, the strains of “Rock With You” or “Beat It” still instantly conjure feelings of youthful exuberance and memories of bygone salad days. 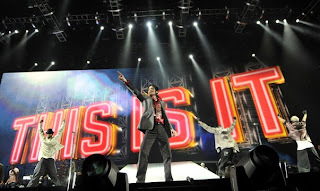 It is difficult to disregard the sheer profiteering motivating the release of Michael Jackson’s This Is It. Complied from footage recorded during final rehearsals for Jackson’s upcoming series of concerts in London’s O2 Arena, the film is clearly being rushed into theaters a scant four months after Jackson’s death by concert promoter AEG Live and other interested parties to recoup losses from the now-cancelled 50 concerts. A DVD/Blu-ray release of the film is reportedly (and unsurprisingly) slated for this Christmas season. But, then the music starts. This Is It plays like a toe-tapping elegy to a musical and cultural icon. It lends behind-the-scenes, fly-on-the-wall insight into the stunning, sometimes garish extravaganza that was to be the London concerts, his first since the HIStory World Tour that concluded in 1997. Moreover, it reveals Jackson in his element: Onstage, exhibiting an almost savant-like entertainment aptitude. Despite his infamous, crippling eccentricities, the film is a welcome reminder that Jackson’s creative flame was never snuffed out. In a way, the raw, unfinished performances – many of them cobbled together from separate rehearsals of the same song – are more accessible and enjoyable than the prepackaged, larger-than-life spectacle that was to follow. A subdued “Human Nature” is ethereal, haunting, and strangely meditative. During a walk-through version of “I Want You Back,” Jackson’s eyes give the far-away look of a 50-year-old who has performed the same song-and-dance routine since he was 12 years old. Conversely, Jackson’s background dancers boisterously cheer him from on offstage throughout “Billie Jean,” prompting director Kenny Ortega to exclaim “Church!” at the end of the number. It is an open question whether the 100-plus hours of video footage shot during the rehearsals was strategically edited, as some claim, to excise any images of a frail, sickly Jackson. That said, most of the performances in the finished onscreen product show Jackson in full command of his talents, full of energy, vitality, and even wit. This Is It is not the authoritative Jackson concert film – for that, watch the Live in Bucharest DVD filmed during his definitive Dangerous tour. Instead, it is a last look at the highlights of Jackson’s song catalog and a poignant coda to his lifework. In death, Jackson finally – and ironically – achieves the image rehab he sorely sought in life. Audiences will walk away sure of two things: It would have been a hell of a concert, and it was – leaving all else aside – a hell of a career. I loved your article about Michael Jackson. I have a website about payday loan canada payday loan . I will add a link from my website to your blog as I think my visitors can find lots of interesting on your blog. Thank you.